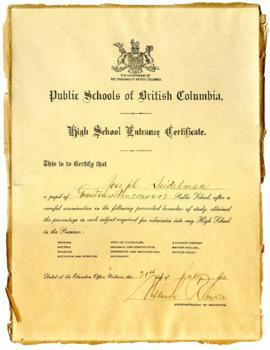 High school entrance certificate, dated July 21, 1911, for Joseph Seidelman. Photograph (from left to right) of Harry, Joseph, Benjamin, and Rachel Seidelman sitting on the steps of their family home at 1735 East 2nd Avenue, Vancouver, British Columbia. 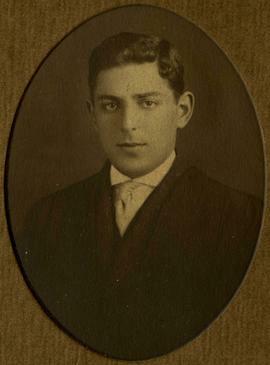 Photograph of Joseph Seidelman in a soldier's uniform. A programme of Oliver Goldsmith's play, "She Stoops to Conquer", held at Britannia High School on April 27 and 28, 1917. On page 3 of programme, Mr. Seidelman is listed as the agriculturalist in the "Science Super Six" group. Card details Harry Seidelman's job title and duties on the R.M.S. Niagara ship, assumed from 1917. A pass for the Trans-Pacific Line of the Canadian Pacific Ocean Services, Limited, for Harry Seidelman. Pass issued on October 3, 1917 and valid on October 4, 1917. Copy of Harry Seidelman's birth certificate, certified June 12, 1918.